Kelly Ripa is possibly the perkiest person on the planet. The all-American daytime staple went from a soap opera star on All My Children (1970-2013) to hostess with the mostess on Live With Regis & Kelly, then Live With Kelly & Michael, then Live With Kelly, and, at last, Live With Kelly & Ryan. Phew! But for all of her adorable quips and toothy grins, Ripa's true disposition may be a lot less sunny than her image on TV. Behold, the shady side of Ripa. When Michael Strahan announced his exit from Live in April 2016. Ripa reportedly felt blindsided by the former NFL star's move to Good Morning America and pitched a fit. A source told Page Six that it was never Strahan or ABC's intention to leave Ripa in the dark about the change. "The plan was for there to be more time between telling Kelly and the announcement," the insider said. "But the story leaked, and the timeline got crunched." Regardless of the cause, Ripa "had a total meltdown," sources said, and called out of work for days at a time. While some staffers were understanding, others called it "classic diva behavior." "There wasn't one day when I was being f**ked with that I didn't show up for work," Stern said on his show (via Radar Online). "You have to figure out how to get back on air even if your boss is f**king you. He added, "If I felt comfortable calling her, I would have said, 'Take a breath. Go into work.' When it comes to work, you can't punish the audience and you can't walk off work." "We've all been humiliated," he quipped, "and we don't make $20 million." 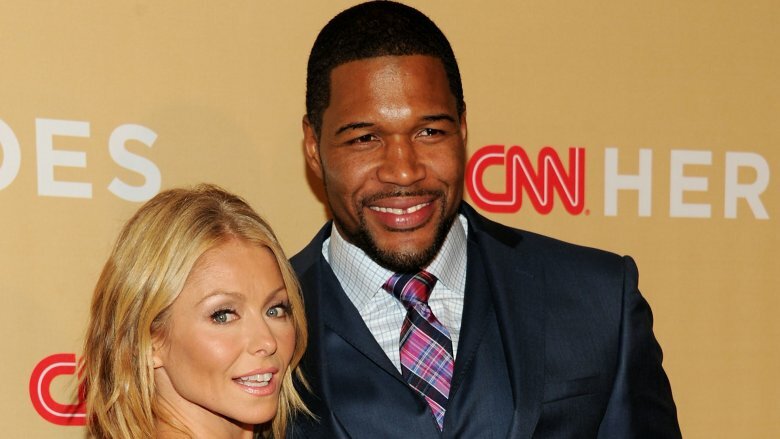 Once Ripa returned to the Live set, she seemed to drive home her her disdain for Strahan by repeatedly bringing up his divorces, which he'd always kept extremely private. She also offered Strahan's job to an audience member, side-eyed him strongly when discussing his exit, and delivered a long, self-righteous speech about being respected in the workplace. She even managed to squeeze in a dig about contract negotiations during an animal segment. Seriously. Aside from her on-air beefs with Strahan, Ripa reportedly wasn't nice to him behind closed doors, either. Strahan told People, "I wasn't surprised by her reaction at all, but I can't control somebody else's actions. I was there four years, and it's about more than just being in front of the camera… At one point I think we were friends. I don't know what happened at the end. I learned a lot from her, though." He added, "Toward the end of it all, we didn't really communicate that much. I kinda looked at it like, 'It was what it was.' I come from a business where you have to collaborate. The show was going well? We're all winning. That's all that matters to me." An insider told Page Six, "[Ripa and Strahan] did not get along. It was all for the show. 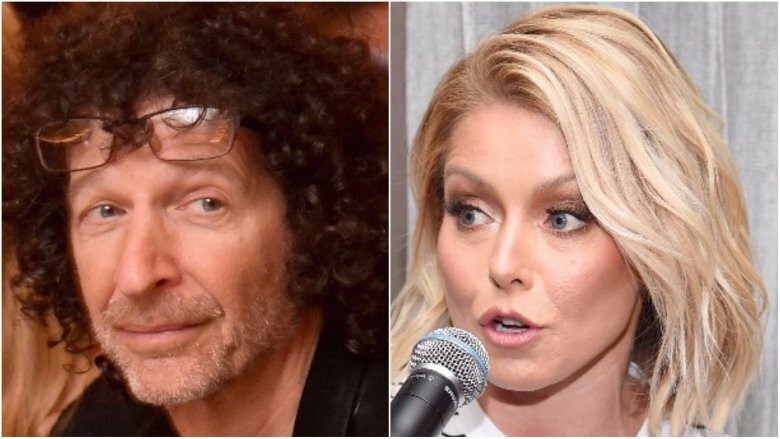 They could not stand each other, and whenever they communicated off-camera, it was always through their reps."
Throughout the Strahan drama, Ripa seemed to go out of her way to be photographed by paparazzi with very specific, deliberate props. On April 26, 2016, she was snapped with pal Anderson Cooper's tome, The Rainbow Comes and Goes: A Mother and Son on Life, Love, and Loss. Anderson, by the way, was Ripa's top pick to take Strahan's place. On May 12, 2016, the day before Strahan's final appearance on the show, she was photographed smiling and wearing a jacket emblazoned with the word "freedom." Subtle. Ripa may have a pattern of viewing anyone choosing not to work with her as a "betrayal." Aside from her beefs with Strahan and Philbin, OK! 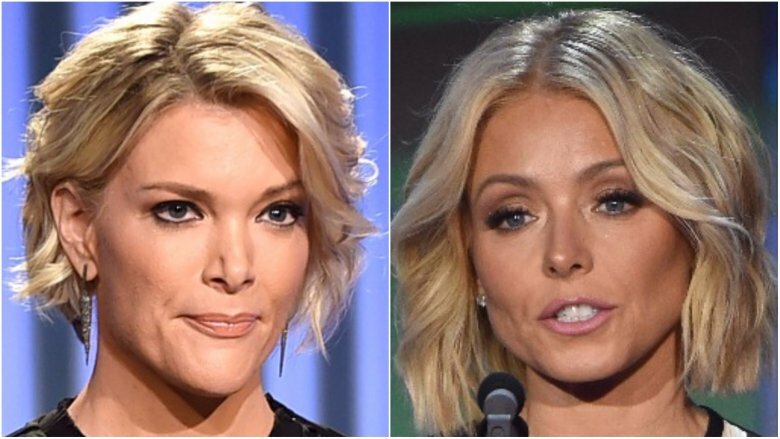 Magazine reported that Ripa was also furious with Megyn Kelly, who had co-hosted with Ripa on Live! in the past. Why? Because Kelly allegedly had the nerve to go off and get her own morning show on NBC. "[Ripa] is sick of being used," a source told OK!. "First Michael Strahan sneaks off to Good Morning America behind her back and now Megyn Kelly is sneaking off to do a show opposite hers. There is literally only so much betrayal that [Ripa] can take and now she is fighting back." In a February 2017 episode of Live, Ripa ripped into her hubby Consuelos, who was guest-hosting. "When there's special married couple time in our house—do you know what I'm talking about? Because there's kids watching so I'm just going to call it 'special grownup time,'" she said. "He's immediately mean to me afterwards! And I don't like that. I think it's bizarre. He becomes short with me…like, irritated. And I'm like, 'Oh, now you're irritated? You were so loving three minutes ago!'" The quip went viral, and the couple had to clear up a few things afterward. "I fly to Dallas and my phone starts buzzing and people are like, 'Dude, are you mean to your wife after, you know?'" Consuelos recalled. "I'm like, 'What are you talking about?'" By the time he arrived on set the next day, he said the trending story on his news app was "Mark Consuelos is mean to his wife after…grownup time." He said he was shocked because he'd considered the entire thing a joke, noting, "No one can be mean after something if they're unconscious. I sleep! I fall asleep afterward." Ripa later joked on air, "Now he's oddly attentive, so it's like there's odd conversations like 'Do you want to watch The Real Housewives? What do you want to do? Would you like pizza? Do you want me to buy you flowers?'" Philbin told The Insider, "I left, and I think she resented that, and I'm sorry, because I wasn't trying to retire from her. I was a little tired, you know? And I was just turning 80." 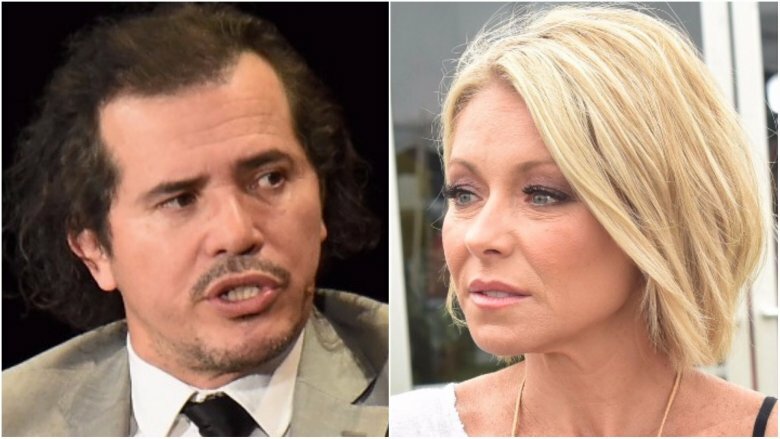 When the time came to find Strahan's replacement, actor John Leguizamo, a frequent guest after Strahan's departure, allegedly believed he had the gig in the bag. A source told the New York Daily News, "He said that they 'strung' him along, and he thought he had it. [He said] 'They even made me get a haircut!'" When Ryan Seacrest was selected instead, Leguizamo was reportedly shocked. Is she already possessive of Ryan Seacrest? Ripa is reportedly being very careful with new co-host Seacrest to avoid any added drama, but rumor has it they're already not getting along too well, in part because of Seacrest's hosting gig for the American Idol reboot in Los Angeles. An insider told Life & Style (via Closer Weekly), "She didn't know about the American Idol revival. When she found out she was truly rattled… She feels stabbed in the back and believes she's going to lose Ryan just like she lost Michael. Kelly is truly p***ed that, after all the time ABC spent negotiating with Ryan for Live, they would then buy the show that made him a household name and take him away. [She] really thought Live would be Ryan's focus." Another source told Radar Online that Seacrest was far from her first choice: "[Ripa] preferred someone less well-known. She wanted someone that she could boss around, and that isn't Ryan." 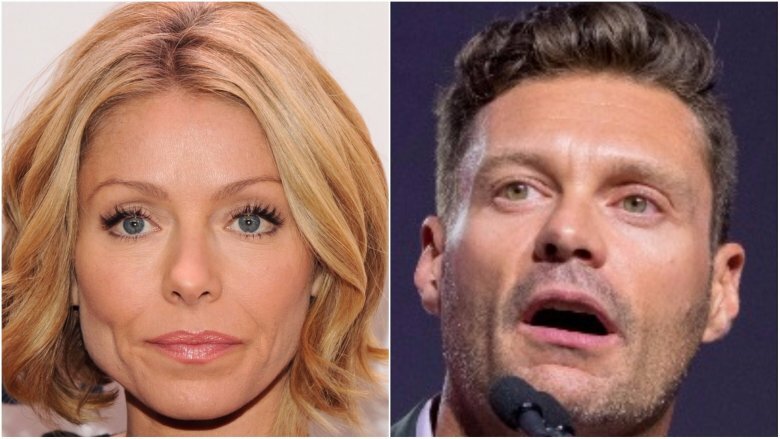 It seems like Ripa holds a grudge, because Page Six reported that she won't let Seacrest appear on Good Morning America, where Strahan still anchors and where Seacrest planned on plugging the ABC reboot of American Idol. "Ryan was scheduled to be on [the Oct. 4, 2017] show well in advance," a source told Page Six. "He's been on the show rundown for a week. Then yesterday, or maybe even as late as last night, Kelly threw a s**t fit and told him he couldn't do Good Morning America, so he pulled his appearance." The source added, "It's very clear that Ryan wants to stay on her good side. She's an executive producer on the show, so she has a lot of pull. It's fair to say she has a lot of influence over him… There's still bad blood with Kelly and Strahan, and she doesn't want history to repeat itself and Ryan to be lured to GMA too." Seacrest's rep denied those claims, telling Page Six, "Ryan had wanted to appear on GMA with the new Idol judges…but with the constant shifting of various schedules, we determined yesterday, along with GMA, as well as ABC/Freemantle producers and publicity teams, that his schedule was too tight given his morning commitments with Live and his radio show, along with Idol production commitments… To suggest any other reason for him not participating is completely false or a misunderstanding of the facts." Is she getting away with bossy behavior? A source told Page Six that despite Ripa's rumored bad blood with other ABC brass, she's not going to face any consequences for allegedly putting the kibosh on Seacrest's aforementioned appearance. "Kelly isn't going to be reprimanded for this, as diva-like as it is, because it's not worth upsetting her for a three-minute hit with Ryan on Good Morning America," a source said. In November 2006, Clay Aiken guest-hosted Live With Regis & Kelly. During a segment, he put his hand over Ripa's mouth to interject and ask a question of their guests. That didn't sit well with Ripa, who snapped, "Oh, that's a no-no… I don't know where that hand's been, honey!" When regular host Philbin returned and asked if there was a "miscommunication" between her and Aiken, Ripa responded, "I'm a 'if you don't have anything nice to say, you shouldn't say anything.' But… I feel like there was a lot of hostility directed [at me]… I was just surprised. He's a Southern boy, so I expected a certain amount of Southern hospitality and manners… there was some impropriety there. There's a lack of respect, and when you're a certain person, you're in the public eye, you have to be respectful of other people, and I don't think that he was respectful in any way… You don't put your hands over somebody's face and mouth when they're conducting an interview, even if it's for a laugh… It was cold, and it was clammy, and I don't want your hand on my mouth in any circumstance, unless I'm choking on a shrimp." After all that, she then insisted, "I don't harbor any ill will." After Ripa tore into Aiken—who had not yet come out as homosexual at the time—fellow talk show personality Rosie O'Donnell took issue with Ripa. On a November 2006 episode of The View, O'Donnell griped about Ripa's rant. "To me that's a homophobic remark. If that was a straight man, if that was a cute man, if that was a guy that she didn't question his sexuality, she would have said a different thing," O'Donnell alleged. A furious Ripa called in to O'Donnell's program. "Listen, I'm watching the show. Rosie, I love you dearly. I have to strongly, strongly disagree with you. I think what you said was downright outrageous," she fumed. "I am the only talk show host, I believe, who's ever interviewed him who didn't question his sexuality. I don't care!" Ripa continued, "He reached across and covered my mouth with his hands… He's shaking hands with everybody in the audience. And it's cold and flu season. That's what I meant. And to imply that it's anything homophobic is outrageous, Rosie, and you know better… It's in the past… Even if he didn't apologize, I forgive him." O'Donnell replied, "I'm just saying, from where I sit as a gay person in the world, that I have to tell you, that's how it came off to me… I feel for the kid. He's in a very difficult space."